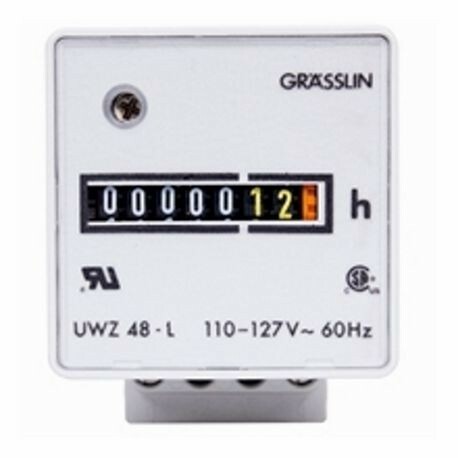 The 120V 60Hz SURFACE MOUNT SCREW LUG TERM There is no mistaking a Grasslin by Intermatic UWZ Series AC Hour Meter. The non-resettable meters meet the IP20 environmental rating for indoor applications and come standard with an accurate synchronous motor. All models have the trademark light gray color with white numerals on black background and yellow tenths and hundredths numerals. An orange dial adjacent to the hundredths digit provides running indication.